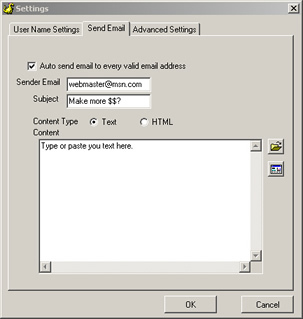 How to send bulk email while searching with Super Email Harvester? How to send bulk email while searching? Super Email Harvester is truly a powerful bulk emailer. It can send out targeted and untargeted mail from a mailing list. It can find and send to any address on almost any server, and do it at the same time!! I can guarantee you if you use it you will get many request from people asking where you got their address from, if you bother to check your disposable address! I have had many such request, and I just keep them guessing. Want to buy bulk email software? Order Super Email Harvester NOW! Looking for bulk email software? Download Super Email Harvester NOW!